Monrovia Hydrangeas are now available at Green Thumb Nursery! Hydrangeas are a beautiful and easy to grow flowering shrub that become blanketed in colorful clusters of flowers set against a rich backdrop of green leaves. These are amazing plants that are perfect for most yards. These are one of the most popular types of landscape shrub due to its gorgeous blooms and nicely textured leaves. 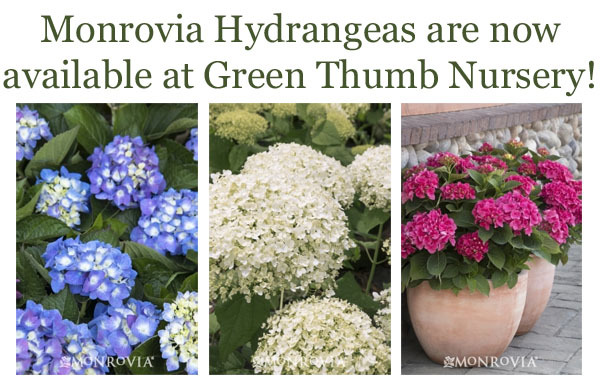 Right now, Green Thumb Nursery has Monrovia Hydrangeas in stock and in many varieties too. Choose from the vivid blues and the crisp pinks and those gorgeous lavenders or the warm and welcoming whites. The short window for planting hydrangeas is here and now is the perfect time to add a big splash of color to your yard and garden. The color palette with hydrangea is very wide. We carry many colors from bright pinks to smooth blues to cool lavenders and creamy whites. We offer a variety of bloom types too, including lace caps and mop tops and leaf varieties such as the oak leaf hydrangea. Many people buy hydrangea for their beautiful flowers, but they can also be an amazing fall plant as many of the varieties will put on a fall display of beautifully colored leaves. Be sure to talk to our experts about the options for the best blooms with the best fall colors. There are a number of beautiful plants and shrubs that pair nicely with hydrangea. One suggestion is black and blue salvia which can contrast pink hydrangea blooms or complement blue blooms. Blue-tone juniper is another both because of its shape and because of their beautiful blue-tone leaves. These pair nicely with all colors of hydrangeas. While easy to grow, hydrangeas are a little tricky. Many people buy a beautiful blue hydrangea and three years later they are wondering why the beautiful blue flowers are now white or pink. The bloom color of hydrangea has a lot to do with the soil in which it is planted. Soil pH and mineral levels must be maintained to keep that rich blue hew to the plants blossoms. Change the soil pH too far and forget to maintain the soil and the blue hydrangea might bloom pink. It sounds really complicated and labor intensive but with a few simple tricks and some fantastic products you can easily control the color of every hydrangea in your yard. Here’s a closer look at what you can do without all the fuss. 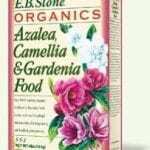 Azalea, Camellia & Gardenia Planting Mix by E. B. Stone – This is a very strong brand with a deep knowledge of plants and growing. They offer a range of generalized and specialized products that help gardeners and landscape professionals success in growing beautiful vistas. Their Azalea, Camellia & Gardenia Planting Mix is an outstanding product for amending soil for hydrangeas or as the soil to fill a pot. 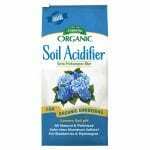 Best of all it is great for most acidic soil loving plants. 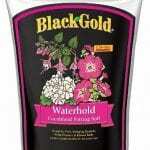 Black Gold — Waterhold Cocoblend Potting Soil — This is an essential product for anyone who is concerned about water usage for landscaping. It is also a perfect answer for growing beautiful plants, such as Monrovia Hydrangea in pots. One of the struggles of container gardening is keeping water available for plants in hot, arid weather. If you have come out in the summer afternoon to find your container plants wilted, this is probably a great product for you. The magic here is the blend of fibrous material that absorbs a lot of water which your plants can tap during the hottest parts of the day. Espoma Soil Products for hydrangeas — Espoma makes a range of soil products that are specific to growing hydrangea. Their soil acidifier is a great product for keeping blue blooming hydrangea blue and their garden lime products cause hydrangea to bloom pink. This is one of the product lines that we referred to earlier when we said that while complex, the process of controlling the color of the hydrangeas in your garden is fairly simple. TIP: For a mix of colors, plant multiple hydrangeas but add one the Espoma Soil acidifier to some pots and the Espoma Garden Lime to different pots. What will happen is that some of your hydrangea will bloom blue and others will be pink or purple. For more tips on creating beautiful blooms using hydrangea soil products, just talk to our garden experts. You can reach out to us in person at any of our locations, via our website, or just give us a call. We are always happy to help. What to Consider When Choosing a Hydrangea? 1. When choosing any type of plant for your garden or landscape, start with your plant hardiness zone. Doing so helps you to pick plants that thrive in your climate. Part of the plant hardiness zone is the average summer high temperature and the average winter low temperatures. Not every plant will thrive in every environment. We are happy to help you figure out which plant hardiness zone you live in. 2. Consider the water requirements of the plants you choose. A plant that needs a lot of water might not do well in a hot environment. Likewise, a plant that needs little water might not thrive in the cooler part of your yard. Hydrangeas grow in many environments but some do better in heat while others do better in cool. 3. Space — Hydrangeas can get quite large, and they make beautiful hedgerows or centerpieces in many settings. They also do quite well in pots or in the ground giving you more options about how many to plant and where you can plant them. 4. Maintenance — For the best blooms, hydrangeas require both soil amendments and pruning. Overall, these are fairly low maintenance plants. 5. Lighting — Most hydrangeas do well in full sun while others might prefer some dappled shade. These five considerations make it easier to choose the best types of hydrangea for your yard. Every yard should have at least one hydrangea as they are nearly unmatched in beauty when in bloom, and they are not difficult to grow. Remember that Hydrangeas are popular and plant and product availability changes on a daily basis for each of our five store locations throughout Southern California, if you are interested in a particular plant featured in our garden newsletter it is always best to call ahead and check if it is available. Do you like what you see? Sign up for our weekly newsletter to get content like this every week! This entry was posted in Newsletter Articles. Bookmark the permalink.